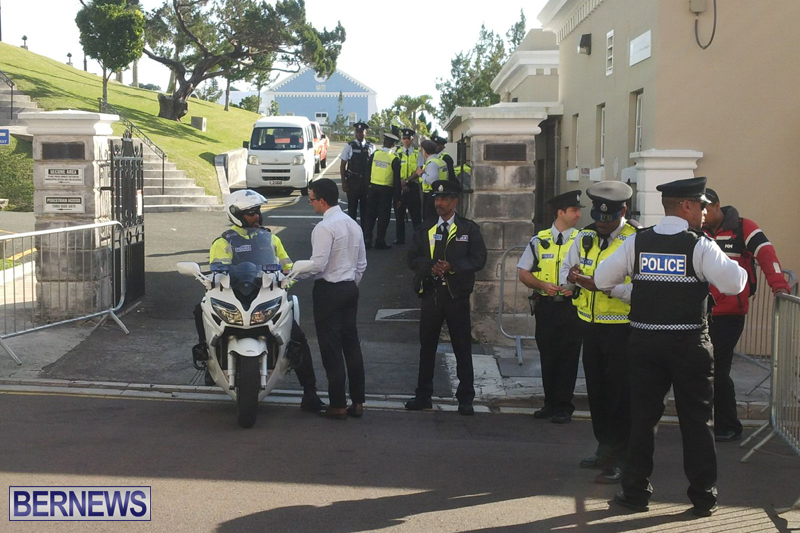 Earlier this week, Police Commissioner Michael DeSilva outlined the policing plan for when the House of Assembly resumes. 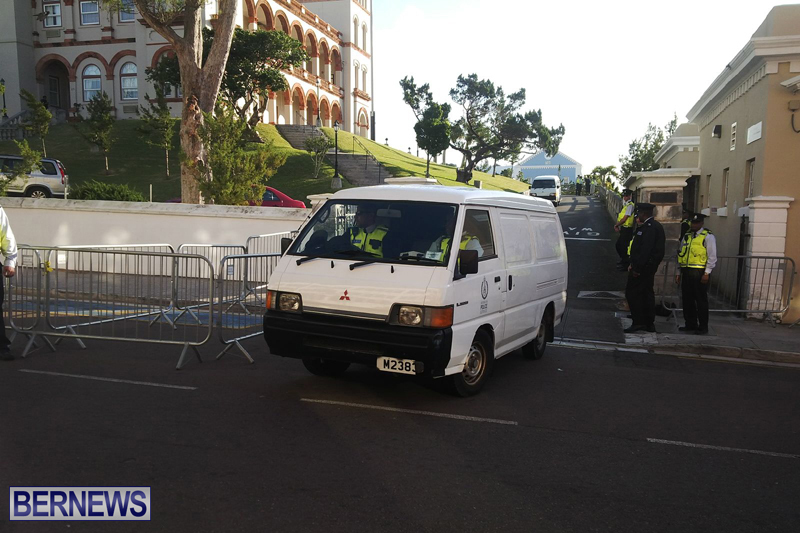 “In order to manage any large crowds that might assemble on the day, Parliament Street will be restricted to one lane of traffic on the western side, between the junctions of Reid Street and Church Street,” the Commissioner said. 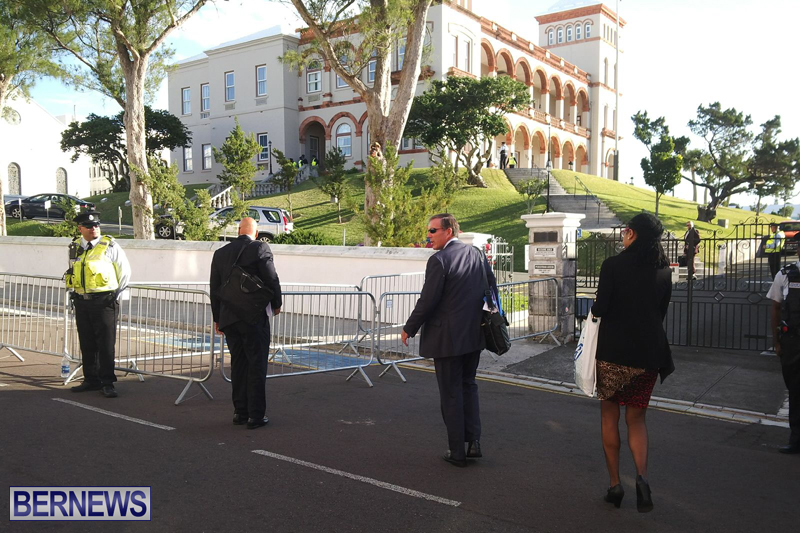 “The eastern side of Parliament Street [the side closest to the House] will be reserved for pedestrians. 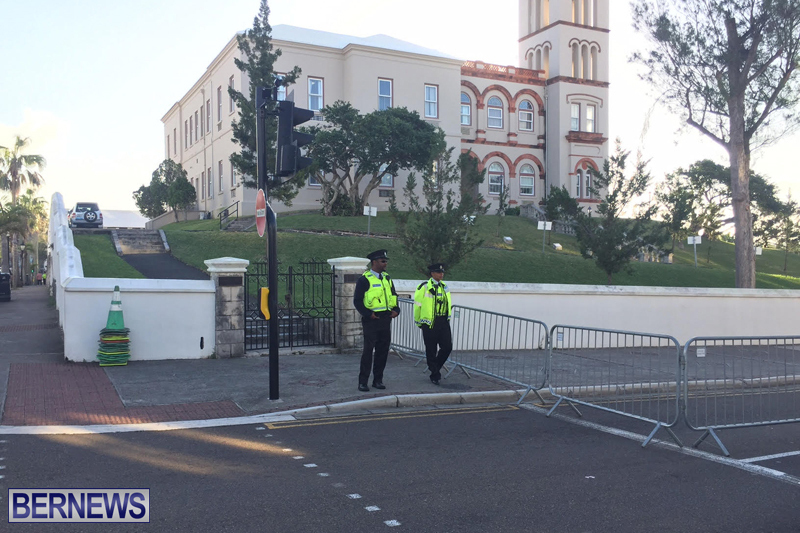 If more space is required, Reid Street will be closed to vehicles after the 9:00 am rush hour traffic has cleared, between the junctions of Court Street and Parliament Street. 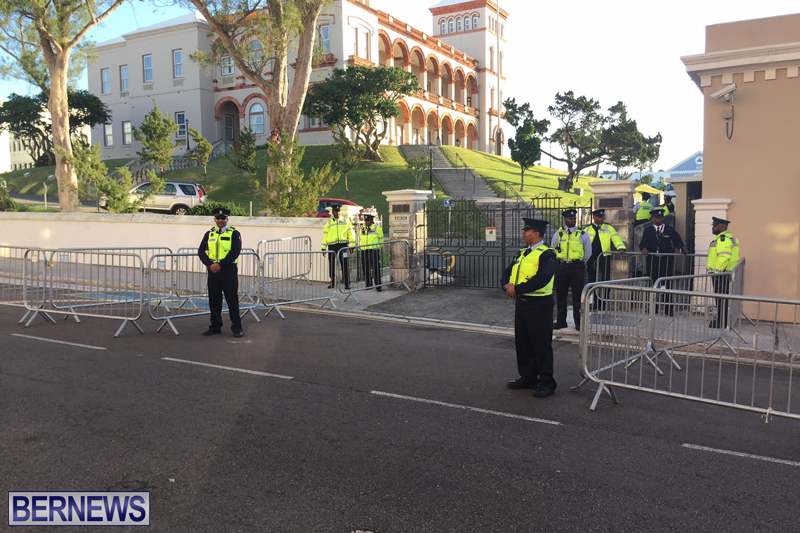 “This will create two sides of the House of Assembly – Parliament Street and Reid Street – that are designated as ‘protest areas.’ The police will consider other road closures, if the need arises, based on the actual numbers that might be in attendance on the day. We are live streaming video from outside the House this morning, which you can view via our Facebook or Periscope pages. 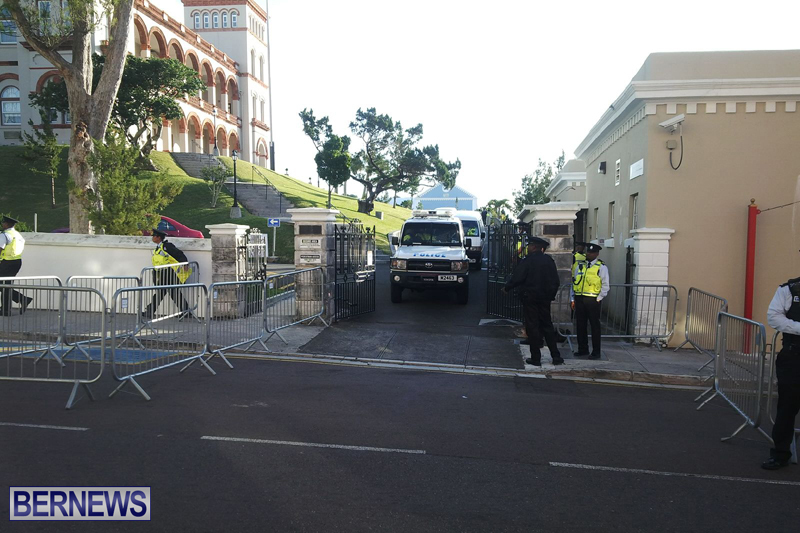 The House of Assembly is scheduled to sit today, having been closed since December 2nd 2016, a day which saw protests over the proposed airport development, MPs blocked from entering, and the police pepper spray some of the protesters. While the House will resume today, debate on the Airport Bills will be deferred to the following Friday, 10th February. In announcing the delay of the debate, Speaker of the House Randolph Horton said, “Government, Canadian Commercial Corporation [CCC] and Aecon have agreed to release and to provide hard copies of the Draft Project Agreement to all parliamentarians in advance of the Legislation’s debate in the House of Assembly. … I guess they’re practicing for next week …. May as well get it right with no one around. It’s a crying shame that it’s come to this point. I say well done BPS. The line is set. You cross it deliberately or beligerntiy it’s an offence. Amongst all the bullying tactics. Yeah you guys only screwed it up the three previous times, maybe you can get it right next time. Didn’t anyone tell them that the debate/vote had been postponed…again! Real waste of resources. But this should at least assure access to parliament next Friday. Hello!!! This is what I’m talking about. This wouldn’t be needed though if idiots didn’t have to act up in the past. You sound really mature calling people who felt the need to exercise their right to PEACEFULLY protest. I guess until you feel it you’ll continue to make these judgments. You should be ashamed of yourself for calling people names. Did your mother name you idiot….I can’t even say I am appalled cause it seems to be the norm when people dislike what someone else is doing. Grow up please. They weren’t peaceful and blocking access to the House is illegal. When asked to move they should have moved. At that point they crossed the line. What exactly did they expect to happen? I heard a union leader repeatedly saying just before the escalation, are you all prepared to be arrested. Play with fire and you are going to get burned. Blocking Parliament has not occurred anywhere else in the World. It would simply not be tolerated and can’t be allowed to happen here again if we value our democracy. Alot has been learned from this episode on all sides. I agree that name calling is not necessary, but why do I keep hearing how it was a “peaceful” protest?!! Maybe for the most part, but one of the videos I saw, a police officer was hit in the head with an umbrella! That is NOT peaceful!! And your last sentence says it all…”seems to be the norm when people dislike what someone else is doing.” That’s why we’re even having this conversation! We shouldn’t be blocking parliament but being “grown ups” and presenting disagreements/arguments and suggestions/proposals in a professional manner to the government. Call in the UK Military immediately! Hit over the riot helmet by an umbrella wielding violent senior citizen? No one has been taken to the gallows for that extremely non-peaceful attack on our boys in blue, totally unacceptable. and the person with umbrella has already appeared in court which was a separate incident, try looking at the peaceful protest from morning til afternoon when things took a turn for worse after peaceful police vigilance was usurped by forceful police! Fake news. It was NOT peaceful. The HOA was forcibly blocked. It was unlawful. Any issues with that, talk to the Chief Justice. Well there are a lot of idiots in America and worldwide protesting against Trump too. The ones smashing things certainly are. And you probably think they’re protesting about similar things. jt that’s not the point. The point is people protest concerning things that affect them and if Bermudians want to protest the airport they why can’t they. I am sick and tired of all this BS about them breaking the law. People are shooting and killing others. People are breaking into homes and people are selling drugs a short distance from the police station. I don’t see the same attention given to those law breakers. Oh I know the MP’s are way more important. Onion Juice I had to look halfway down the page for your comment! Lol. Do you think the usual name callers get your point! Another site for tourists to visit. Bermuda IS another world. And how much money is being spent on today’s unnecessary exercise. They knew the bill wasn’t being debated today. 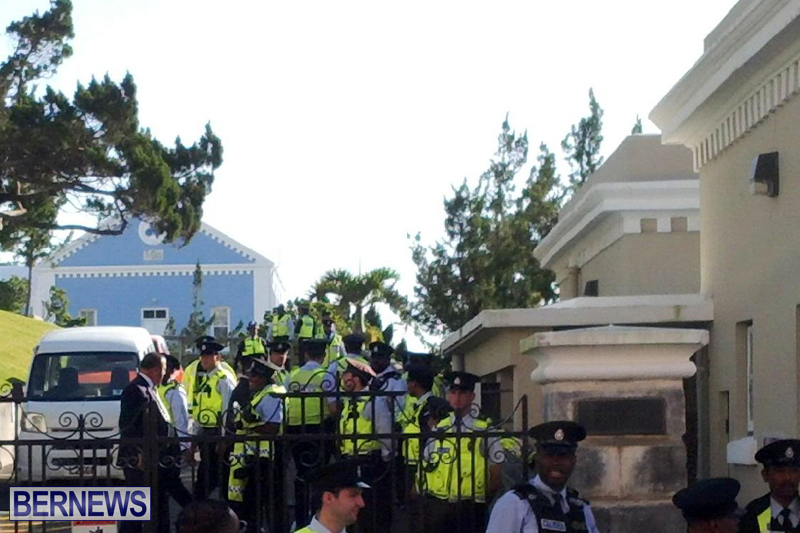 Maybe some of these police are on overtime as their normal every day routines would not include standing outside House of Assembly all day. FYI…No officers are being paid overtime today. All had their rest day today cancelled weeks ago and will be owed another rest day. Get your facts straight first! Facts have an OBA bias! Watching, exactly. The Police looked stupid out there all day for not one protester. Heads need to roll starting with the incompetent Commissioner of the Police. Nowhere else in the world a public official would get paid $170,000 while continually failing in their duties. And those who run things that are sitting back and collecting from what they’re funding. Or slowly reading or doing the homework they should have done for today’s scheduled debate. Delays….. It appears the only murders and attempted murders they can not solve are the ones a certain some commit. Why this week? Didn’t the BPS get the memo? No discussion on Airport today. Everyone knows that. Considering the criticism of the BPS in not being prepared last time, I’m assuming that this is a good exercise and practice. Hopefully it will reduce any confusion next week. Send the bill to the PLP, the BIU, the BPSA & the PC. They make all of this necessary. Without them the tens of thousands already run up in costs would not be necessary. The money could be spent on something much more productive. Today would be just another quiet day outside of the HOA. As someone has stated, no over time was paid today, so there really is no issue. I’m sure those who protested however will have been paid, or will simply take a “sick” day in lieu. That’s exactly what it was. A little show so the public will know what to expect next time and hopefully deter the umbrella bandits from striking again. Whilst it may be a good idea to do an excerise but seriously all night and all day. Way over the top and totally unnecessary. They looked like silly billies. Guarding an empty House. What a damn joke. …and if protesters showed up and the Police weren’t prepare, you would complain about that too. I would say that it’s a show of force, like a preview. So everyone is aware that the next time around the illegal action won’t work. Actually, it is a brilliant ploy by the PLP and Peoples Campaign. It makes the Government look like fools. Wrong. It makes them look like they mean business and they are saying don’t try the Dec. 2 crap next week. Truth, everybody has an opinion. I think it made them look silly. Way over the top. The police here are a joke. They don’t mean business at all. If the top is weak sonshall the bottom. All the police worry about is public opinion. No! It makes the police look like they are prepared for any foolishness!!! Well this is a rather efficient use of BPS resources…hopefully the police successfully deterred the 3 lizards I saw nearby from breaching the perimeter! Maybe we can use drones next time to counter avian threats?? it is a shame that those preparations are necessary ! lets see next week , when all the “peaceful” demonstrates will show up again . BPS head up , you are doing well. all my respect for you !!!! Good grief, people! Don’t you have anything better to do than malign Govt. and the Police – who, by the way, do not report to the Govt.? Brilliant campaign by the PLP and Peoples’ Campaign? It was their actions that made this type of contingency necessary, so if you are looking for someone to attribute the cost of the Police presence look to them. Classic military tactic get your opponent to deploy his forces where no attack will take place. If you’re going to tell someone stfu on social media have the guts to use a real name. So the union sees this as a ‘military’ operation. Not very surprising then that they’re problems then is it. Oh for Goodness Sakes!!!!!!! Why are some blaming the actions of grown adults on the PLP and the People’s Campaign???!!!! Those organizations did not have meetings and tell the Grown Adults to do what they did on Dec 2, 2016!!!!!! Yes they did say we will meet to protest but they didn’t say use your umbrellas to hit people or nor did they give instructions to be unruly!!!!!! So stop putting the blame on those organizations. Put blame where it should be. 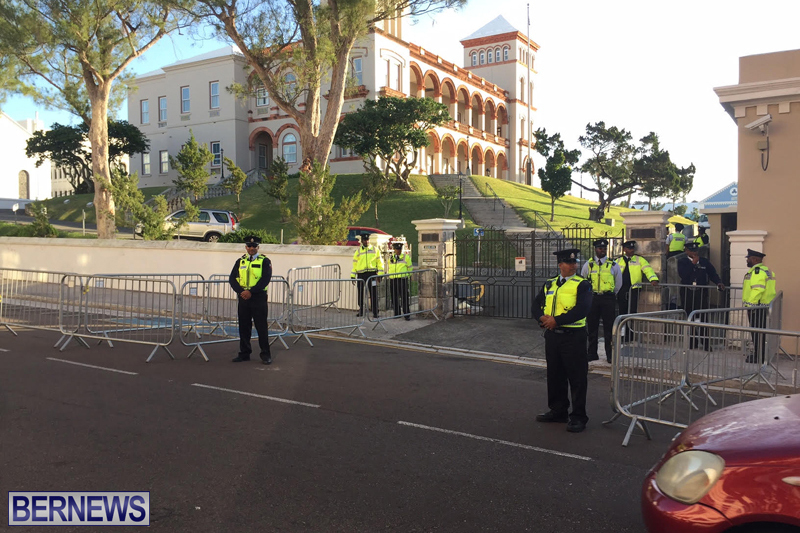 Did you miss what Derrick Burgess JP MP said both before and during the December 2nd protest? 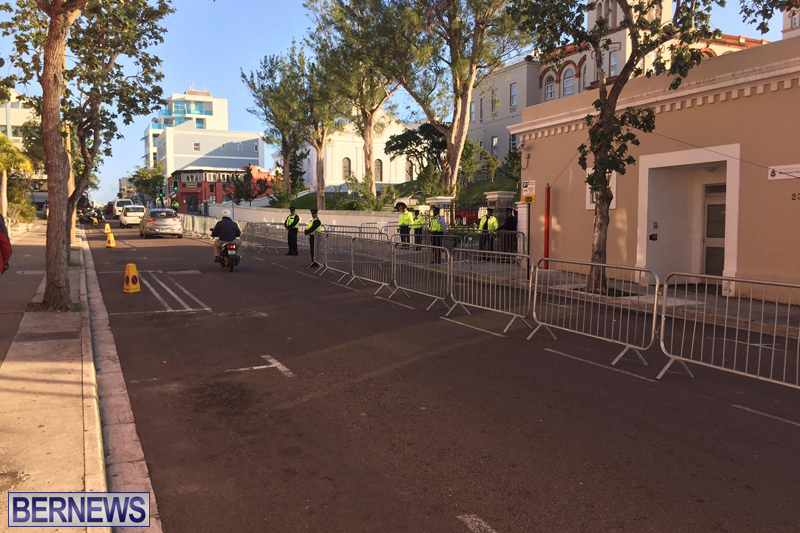 It was stated by the Commissioner of Police that the reason for not allowing the public on the grounds is because there is not enough room for large crowds. TI sounded like a lame excuse to me. To prevent the public from entering public property to protest is undemocratic. 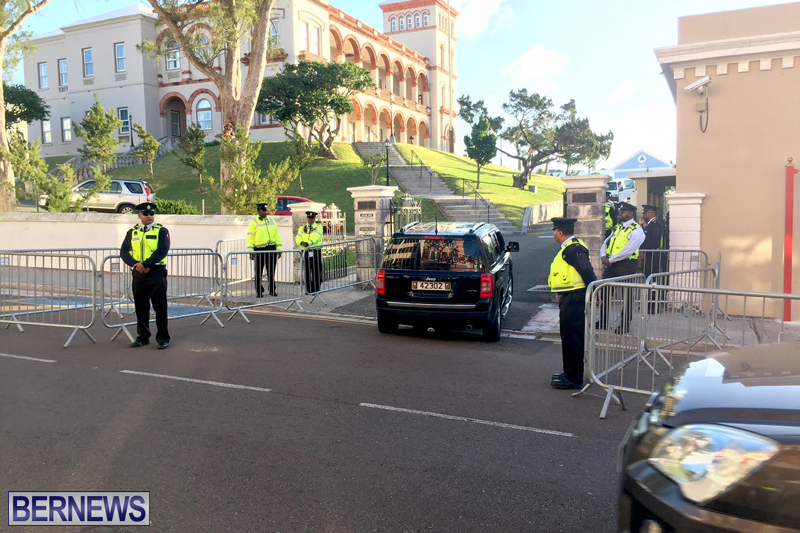 It seems to me that if the excuse is that the grounds are too small for large crowds then the police might consider crowd management instead of crowd control. Determine how many people there is space for, count them as they arrive, and close the gate after that number is reached. The remaining numbers can stand on the sidewalks. Fact is you cannot control people in a area that is not enclosed. So There! The space is an enclosed space and surrounded by vehicular traffic. There could easily be a problem if large crowds were to protest there, especially if there was an emergency. The BPS have created more manageable spaces for protest to occur. 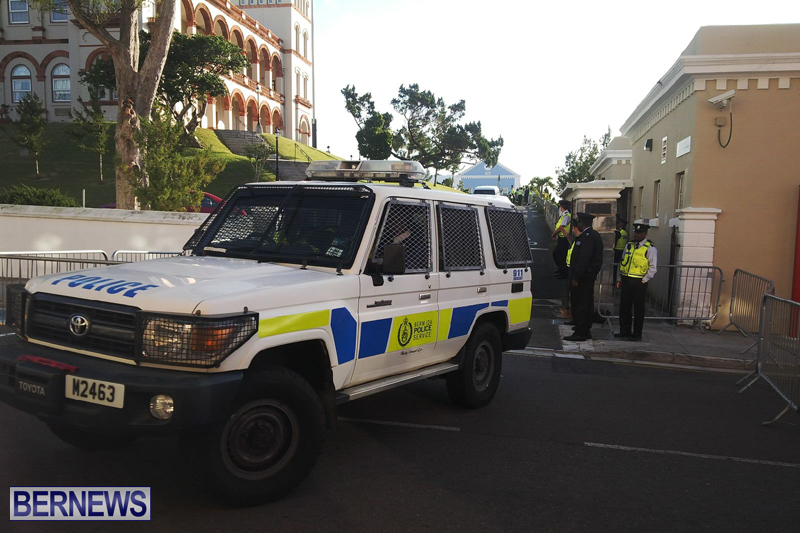 THE POLICE COMMISSIONER NEEDS TO BE INFORMED OF THE LAW BECAUSE BY PREVENTING THE PUBLIC FROM ENTERING PUBLIC PROPERTY,HE AND THE BPS ARE DOING JUST WHAT THEY ACCUSE THE PROTESTERS OF DOING….BREAKING THE LAW!!! THE ONLY THING THAT THE BPS CAN DO IS PREVENT OVERCROWDING OF THE GALLERY IN HOA!!! COMMISSIONER,YOU BETTER SORT IT OUT NOW BEFORE YOU HAVE AN EVEN BIGGER PROBLEM COME NEXT WEEK!!! Sorry, how is the BPS breaking the law by seeking to prevent a breach of the peace? Cite the law the BPS are breaking. Which law are they breaking? Please post a link to it. Still waiting on that point of law?? Stick to WHAT you know…. I dont see anywhere above were YOU asked me about the point of law?? Post under different names huh! FYI i made a statement I am not answering your questions which makes you irrelevant to me so go look for your entitlement elswhere.Im sure you will reply because THETRUTHHURTS. Save your energy because i will not reply to you!Have a blessed weekend! What a cop out. Makes false statement and won’t back it up. That doesn’t make the people responding irrelevant, it makes what you say irrelevant. What a joke. Lock them up! They cant stop the peoples business again. They do not represent the majority and we all know that. Enough. Build the frickin aiport already! Great tactic Mr. Commissioner, pen the taxpayers like cattle, much easier for your guys to pepper spray them! I bet you don’t have a problem being treated like cattle when you buy a ticket to a concert. People want to cry about pepper spray, well I suggest you bring a pair of goggles and a fish sandwich next time. If the need ever arises for a can of tear gas you’re going wish they would wash your eyes out with pepper spray, believe me. You cant please everybody,you cant even please some people anytime.We want a Police Service,when the Police do,nt arrive,,,they say ,,,where are the Police,? when the Police do arrive,,,some say ,who called the Police,,,?Good Job Police keeping the ,,,peace ,,and good order,,,,admitting your own mistakes,,,then correcting them next time,…every problem needs a different approach ,,,every problem has a different outcome……everyone has an opinion,,,they are as common as noses,,just different.Peace,,,! Whay no seniors walking across that they can pepper spray? Why doesn’t the regiment get involved ! They get paid enough money to play toy army up there put them to good use . the more the merrier bring the guns also . Let’s show the people we finally mean business. What Bermuda really needs is a complete and total purge. Get rid of every single last person involved in the OBA & the PLP and start over with fresh faces. No-one out here really trusts any of them from either side. They’re all so caught up in destroying each other’s parties that they can’t even see they’re just destroying Bermuda in the process. Personally, I think England should get involved. Send down some real politicians, take control, get Bermuda up and running again, then select NEW people and create two completely NEW parties, hold an election and hand the reigns over to the winner. Because NO-ONE in either current party has a clue. We are all such spoiled babies, running around throwing tantrums when we don’t get our way. Queen Elizabeth …. please break out your belt and start whoopin’ some butts over here. These lot need licks and time outs. And possibly some binkies (pacifiers)….